In lieu of flowers memorial donations may be made to the First Baptist Church Scholarship Fund and left at the funeral home. 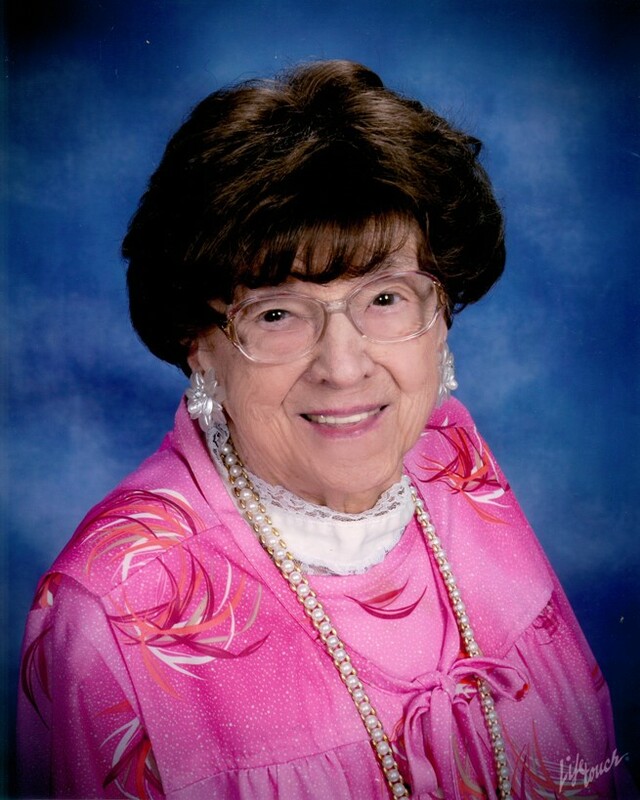 Velma Luberta (Shoemaker) Henderson, age 94, of El Dorado Springs, MO, passed away October 20, 2015. She was born May 19, 1921, in El Dorado Springs to Jesse V. and Lula M. Shoemaker. She spent all but two years of her life in El Dorado Springs and graduated from the El Dorado Springs High School in 1939. She joined her dad, brother, and sister in the grocery business, where she worked for 49 years. She was converted and joined the First Baptist Church in 1937, where she served faithfully in all aspects of the church’s activities. On May 16, 1954, she was married to Melvin Henderson and they were married twenty years before his passing. They chose to adopt a sister and brother in 1962, Connie and Max. After her husband passing, she joined many clubs and organizations which she thoroughly enjoyed. She made many friends as she was privileged to attend many local, state and national conventions. She was a charter member of the Business Professional Women (now Professional & Business Women), Royal Neighbors, Iris Belles Federated Garden Club, American Legion Auxiliary, and Hospital Auxiliary. She was involved and cheerfully served in her church’s spreading the gospel by teaching beginner’s Sunday School Class for over twenty years, and serving as Sunday School general secretary, church treasurer, music leader and junior choir leader, BYPW director, Golden Agers coordinator, chaperone on two trips, and on many committees. She was a loving and caring mother, grandmother, and great-grandmother. Even after the store closing, she shopped for groceries for five elderly ladies and took them to doctor’s appointments for many years. She was a friend to all. She enjoyed traveling and coordinated many outings for the Golden Agers to enjoy. Preceding here in death were her parents; her husband; brother, Vivian Shoemaker; sister, Elda Jean Ketterman; and two grandsons: Jimmy Sears and Raymond Young. Survivors include two children: Max L. Henderson of Meza, AZ, and Connie Young of El Dorado Springs, MO; four grandchildren: Jeremy Henderson, Melissa Young, Amy Gibson, and Katelynn Henderson; ten great-grandchildren; one sister, Arda Faye Bruce; and many other relatives and friends. Funeral services will be held on Saturday, October 24, 2015, at 1:00 p.m. at the First Baptist Church with Rev. Ron Marsh officiating. Burial will follow in the El Dorado Springs City Cemetery under the direction of Bland-Hackleman Funeral Home. Pallbearers will be: Ken Perrodin, Trenten Pyle, Jeremy Henderson, Lewis Eslinger, Jeffrey Chambers, and Randall Chambers.